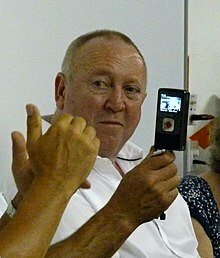 Keith Richard Taylor (born 1 August 1953 in Southend-on-Sea, Essex) is the Green Party's MEP for South East England and the Party’s animal rights spokesperson. The senior Green politician was formerly one of the two Principal Speakers of the party from August 2004  to November 2006. Taylor later gained prominence for being, at the time, the Green Party's most successful parliamentary candidate ever in the UK, after winning 22% of the vote in the Brighton Pavilion constituency at the 2005 General Election. Following the 2010 General Election, Taylor was appointed to the European Parliament to sit with the Greens–European Free Alliance. Before becoming a Green Party activist, Taylor lived in Brighton and owned a local business. Taylor "took to community activism opposing an inappropriate local development", leading him to join the Green Party. Taylor was a participant in the campaign by BUDD, opposing the development now called the New England Quarter adjacent to Brighton railway station. In 1999, Taylor was elected as a councillor on Brighton and Hove City Council, representing the St. Peters and North Laine ward. He became Convenor (the local group's name for its leader) of the Green group of councillors on the City Council. During his time as a councillor Taylor was a member of the Policy & Resources Committee, the Adult Social Care & Health Committee, the Housing Committee, the Joint Commissioning Board, the Shoreham Airport Joint Committee, the Housing Decision Procedures Scrutiny Panel and the Licensing & Regulatory Functions Sub-Committee. Taylor stood in 2001 and 2005 as the parliamentary candidate for the Green Party in the Brighton Pavilion constituency. Taylor received 9.3% in 2001 and 21.9% of the vote in 2005. In August 2004, Taylor was appointed as a replacement for Mike Woodin as the Green Party's Male Principal Speaker alongside Caroline Lucas. The Guardian stated that Taylor "defies the stereotype of Green politicians as earnest or bookish academics". Taylor was confirmed in the post after a by-elected in November 2005, beating Derek Wall by 851 votes to 803; again, serving alongside Lucas. In November 2006, Taylor lost re-election to Wall by 767 votes to 705. In 2007, Taylor faced Lucas to be the Green Party's parliamentary candidate for the Brighton Pavilion constituency 2010 general election. Taylor, on announcing his campaign, said, "This will be the third time I've contested this seat. I inherited a 2.6% vote for the Greens and have built that up to 22%. Next time, if I am selected again Brighton voters will make history in electing me the country's first Green MP". Lucas, in a letter to local party members, said that she had been invited to stand by several local members and described it as "the most difficult decision of my life" because of her "personal and family commitments" and her "loyalty and commitment to Keith Taylor, who is a person and a politician for whom I have great admiration and respect". On 18 July 2007, it was announced that Lucas had been selected ahead of Taylor by the Brighton Green Party. Lucas won with 55% of the party ballot against Taylor's 45%. Taylor congratulated Lucas and pledged his support for her campaign. On 5 May 2010 Lucas was elected as Member of Parliament for Brighton Pavilion and upon doing so was required to resign as the MEP for the South East of England. Taylor being second on the Green Party list was appointed as Lucas' replacement to serve out the remainder of the term until 2014. Taylor was also required to resign as a local councillor under European Parliament rules on dual mandates. Taylor was reelected as MEP for the South East region in the 2014 Euro election, with 9.05% of the vote. Taylor is an early signatory of the International Simultaneous Policy (SIMPOL) which seeks to end the usual deadlock in tackling global issues. Taylor became a signatory of SIMPOL in May 2009. ^ a b "Greens appoint new figurehead". Greenparty.org.uk. 6 August 2004. Retrieved 16 January 2017. ^ a b c "Siân Berry and Dr. Derek Wall elected as Principal Speakers". Greenparty.org.uk. 24 November 2006. Retrieved 16 January 2017. ^ a b "Cllr. Keith Taylor's Green Party Website Biography". Greenparty.org.uk. Retrieved 16 January 2017. ^ archive referring to BUDD under heading 'Sainsburys' Archived 20 July 2011 at the Wayback Machine. ^ Matthew Tempest, political correspondent (6 August 2004). "Greens name new figurehead". The Guardian. Retrieved 16 January 2017. ^ Lawrence Marzouk (14 June 2007). "Greens Battle to Be the First MP". Brighton Argus. Retrieved 16 January 2017. ^ Andy Dickenson (17 July 2007). "Greens Pick MEP Lucas to Run for MP". Brighton Argus. Retrieved 16 January 2017. ^ "South East England (European Parliament constituency) -". BBC News. Retrieved 16 January 2017. Bennett, Natalie; Bütikofer, Reinhard; Jeraj, Samir; Jordan, Klina; Juniper, Tony; Lambert, Jean; Lucas, Caroline; Rüdig, Wolfgang; Scott Cato, Molly; Taylor, Keith (2019). Ward, Liam (ed.). Greens for a Better Europe: Twenty Years of Green Influence in the European Parliament, 1999-2019. London: London Publishing Partnership. ISBN 978-1-907994-88-3.